I love social media and many of you can relate. It’s nice to keep in touch with friends, family, loved, ones, and those you’ve met with similar interests. As a city-girl turned farm-girl, I’ve often said “without social media, I’d be much less happy”. I’m a people person and social media allows me to stay connected even when days go by without seeing anyone outside of my immediate family. My community has recently found itself in the middle of a social media storm…and it feels awful personal. I truly don’t want to get into the nuts and bolts of what’s going on because it’s getting enough attention, but I want to know what you would do in a scenario where social media turns against you. 1) You write what you hope is a bestselling novel and somehow you offend the local bakery owner who is suing you for slander. Everywhere you turn, there is your face with negative comments (because of course, those hit us the hardest and we struggle to see the good). What do you do to protect yourself and your family? 2) The chief of police in your home town is standing trial for drunk driving. Social media is making a joke out of the situation and people are talking about how everyone from your town is a no good drunk. What do you do to protect yourself from feeling ashamed of your heritage? 3) Your niece has been killed in a drunk driving accident. Her photograph and that of the driver is everywhere you look. Accusations are flying about what she was doing driving so late at night and people are saying hateful things about her and her parents who are in mourning. What do you do to find the positive and uplifting posts without muddling through the hurtful comments and posts about someone you love? Some people have chosen to deactivate their social media until things die down. Some have unfriended anyone who doesn’t feel the same way they do about this particular situation. Some have just stopped logging in. Others have chosen to engage with the negativity in hopes they’ll get their point across and help others understand. I think it’s important for each of us to come up with a plan to protect ourselves. It’s next to impossible to hide all negativity from our newsfeed and for those of us who rely on social media for our daily pick-me-up, it can be devastating to consider deactivating our account. What’s your plan? Have you ever found yourself in a similar situation? What did you do? 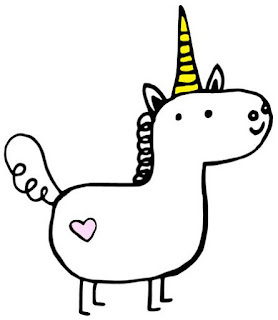 Until I can come up with a plan, I'm going to hop back on my happy unicorn and chase those rainbows! Crystal is a church musician, babywearing mama (aka crunchy mama), business owner, active journaler, writer and blogger, Blog Tour Manager with WOW! Women on Writing, Publicist with Dream of Things Publishing, as well as a dairy farmer. She lives in Manitowoc County, Wisconsin with her husband, four young children (Carmen 8, Andre 7, Breccan 2, and Delphine 10 months), two dogs, two rabbits, four little piggies, a handful of cats and kittens, and over 230 Holsteins. This is a thought-provoking post, Crystal! I don't really do social media except for business, so I always have a mission in mind and try to stay away from deeply personal topics. Politics and religion are always off my list because people have their beliefs and I certainly can't change their mind. I don't even discuss that stuff with my family! Now that I think about it, I think I know exactly what you're talking about, and in a weird coincidence I just started watching that show today on Netflix. I always keep an open mind and make sure I don't make blanket statements about everyone just because they live in the same town. That's ridiculous. If everyone judged me by the actions of the corrupt cops in Long Beach or the corrupt city officials, they would have a lot of ammunition! I guess I'm not connected enough to my city but I think it's wonderful that you feel so deeply about your community. A few days after Christmas, a relative of my hubby's was shot in Hollywood Hills. He was twenty-seven and a father of two. I read a comment on a news site that he must've been a gang member, which is not the case. People saying those kinds of things are just ignorant and I mostly choose to ignore it until I can't anymore. I guess it depends on where it comes from and how personal the issue is. I can't agree with you more, Crystal. I see so many negative posts in my feed, and it's very disheartening. I usually just quickly scroll past them as soon as I realize they're negative, and move right on to the next positive post. It would be great if people didn't air their dirty laundry on social media or use it as a soapbox, but I don't see that happening. I do, however, hope they'll stop using it to punch people in the gut.